Summary: Researchers have implicated an enzyme that appears to make both Tau and alpha synculein more toxic in Alzheimer’s and Parkinson’s disease. Inhibiting this enzyme has already proved helpful in treating animal models of Alzheimer’s disease. The researchers report they are moving on to testing drugs that inhibit AEP in animal models of Parkinson’s disease. AEP protease acts on amyloid, tau and now alpha-synuclein. In both Alzheimer’s (AD) and Parkinson’s (PD), a sticky protein forms toxic clumps in brain cells. In AD, the troublemaker inside cells is called tau, making up neurofibrillary tangles. In PD, the sticky protein is alpha-synuclein, forming Lewy bodies. Ye and his colleagues had previously identified an enzyme (asparagine endopeptidase or AEP) that trims tau in a way that makes it more sticky and toxic. Drugs that inhibit AEP have beneficial effects in Alzheimer’s animal models. In a new Nature Structural and Molecular Biology paper, Emory researchers show that AEP acts in the same way toward alpha-synuclein. 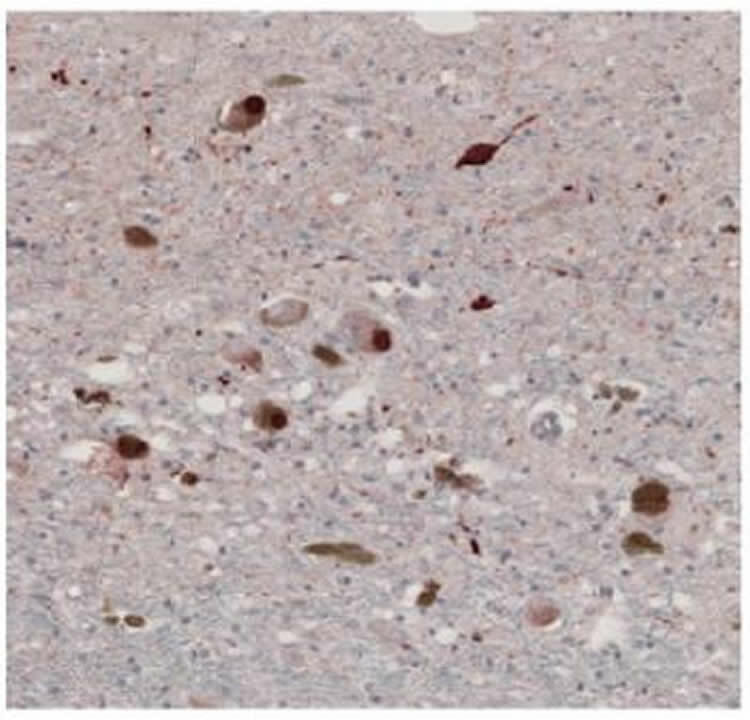 This is a Parkinson’s disease brain sample, stained with an antibody that only recognizes the N103 chunk of alpha-synuclein, which is generated through cleavage by AEP. NeuroscienceNews.com image is credited to From Zhang et al NSMB (2017). Ye cautions that AEP is not the only enzyme that cuts alpha-synuclein into various toxic pieces, and the full-length alpha-synuclein protein is still able to aggregate and cause harm. Nevertheless, he says his team is moving on to testing drugs that inhibit AEP in Parkinson’s animal models. Funding: The research was supported by the Michael J. Fox Foundation, the National Natural Science Foundation of China and the National Eye Institute (P30EY006360 and R01EY004864). Image Source: NeuroscienceNews.com image is credir=ted to From Zhang et al NSMB (2017). Emory Health Sciences “Alzheimer’s and Parkinson’s Spurred By Same Enzyme.” NeuroscienceNews. NeuroscienceNews, 3 July 2017. Emory Health Sciences “Alzheimer’s and Parkinson’s Spurred By Same Enzyme.” http://neurosciencenews.com/alzehimers-parkinsons-aep-7018/ (accessed July 3, 2017). Aggregated forms of α-synuclein play a crucial role in the pathogenesis of synucleinopathies such as Parkinson’s disease (PD). However, the molecular mechanisms underlying the pathogenic effects of α-synuclein are not completely understood. Here we show that asparagine endopeptidase (AEP) cleaves human α-synuclein, triggers its aggregation and escalates its neurotoxicity, thus leading to dopaminergic neuronal loss and motor impairments in a mouse model. AEP is activated and cleaves human α-synuclein at N103 in an age-dependent manner. AEP is highly activated in human brains with PD, and it fragments α-synuclein, which is found aggregated in Lewy bodies. Overexpression of the AEP-cleaved α-synuclein1–103 fragment in the substantia nigra induces both dopaminergic neuronal loss and movement defects in mice. In contrast, inhibition of AEP-mediated cleavage of α-synuclein (wild type and A53T mutant) diminishes α-synuclein’s pathologic effects. Together, these findings support AEP’s role as a key mediator of α-synuclein-related etiopathological effects in PD.